When Pigs Fly Returns: Horns & Spikes Part 3: Jugal "Horns"
Horns & Spikes Part 3: Jugal "Horns"
The ceratopsian jugal horn is unique in that it comes in two distinct forms: a non-capped form, where the jugal itself flares outward to a point without the assistance of an epijugal ossification; and a capped form, where the jugal flares outward to (usually) a point and is also capped by a separate epijugal ossification, sort of like the nasal horn. What's especially interesting is that the most impressive jugal horns--non-capped forms--are found in the most basal ceratopsians. The crowded genus Psiattacosaurus includes three species with particularly impressive jugal horns: P. sibiricus, P. major, and P. gobiensis. In P. sibiricus, the jugal horn width (from tip to tip) is greater than the length of the skull. This Russian genus also has the distinction of being the horniest (snicker) psttacosaur. In addition to its impressive jugal horns, P. sibiricus also has small postorbital horns and amazingly large palpebral horns. I would not want to mess with P. sibiricus! 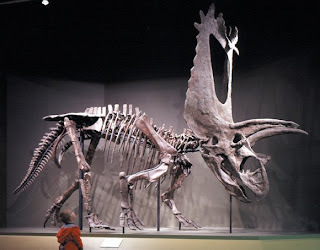 P. major is the largest species in the genus and features a large, triangular jugal horn which, unlike P. sibiricus but like most other ceratopsians, points lateroventrally. While not as wide as the skull is long, the jugal horn width is substantial, and a good swing of P. major's head could cause some serious damage. 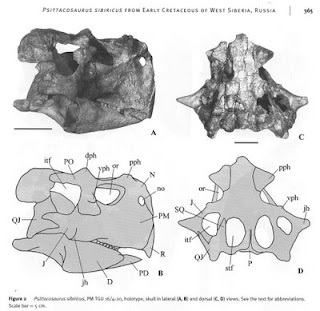 Finally, P. gobiensis, the most recently-described species of Psittacosaurus, has large, laterally-pointing jugal horns that are textured in such a way as to suggest a large keratinous covering. Interestingly, P. gobiensis' jugal horns curve gently downward along their length, unlike the straight jugal horns of P. sibiricus and P. major. Among ceratopsians, these species have (so far) the most impressive jugal horns! Epijugals didn't pop up until later in coronosaur evolution. Protoceratopsids (like Protoceratops, above) have large, flaring jugals with rounded ends and similarly rounded, blade-shaped epijugals. 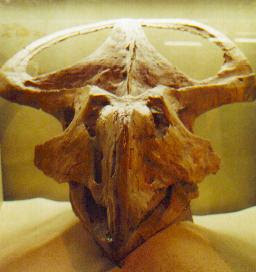 They give the skull a unique look in anterior view. Ceratopsidae never developed the jugal "spikes" of psittacosaurs or the flaring jugal blades of protoceratopsids. 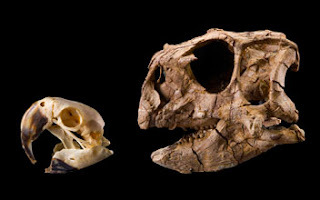 Focusing instead on postoribtal and/or nasal horn development, most ceratopsids simply forgot about their jugal horns. In almost all specimens, the epijugal quickly fuses to the underlying jugal bone, and the two grow outward together. The separation is barely apparant in older animals. Just one chasmosaurine, Pentaceratops, has managed to somewhat revisit the glory days of jugal horns. Pentaceratops has a jugal horn length of about 144 mm. That may seem huge, but keep in mind that that's 14.4 cm, or about six inches--nothing to brag about when your postorbital horns are 56 cm long (about two feet). Jugal horns are not phylogenetically relevant unless you're talking about the separation between capped and non-capped forms, which seems to be a consequence of higher taxonomy (coronosaur or non-coronosaur). Among ceratopsids, the jugal horns are almost always short and unimpressive, and all those illustrations you see of Triceratops with whopping jugal horns are almost certainly inaccurate, unless the epijugal was, itself, capped by a massive keratinous cover, which I find unlikely. The large jugal horns of protoceratopsids may have had some role in sexual display or species recognition (or sexual dimorphism), and the retention of epijugals was probably inhereted by ceratopsids, but that group never really did anything with them. They may be vestigal structures, overshadowed by the other horns and spikes of the head. Zack, great post! 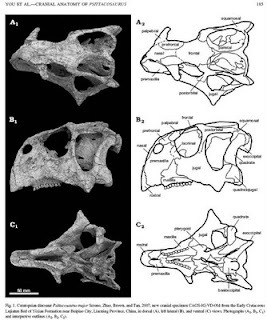 However, you missed to mention Psittacosaurus sinensis and P. xinjiangensis, which have also VERY large jugal horns; a skull wider(from tip to tip) than long is found among psittacosaurians, also in P. sinensis, lujiatunensis, and IVPP V 12617 (described as the adult morph of 'Hongshanosaurus'). P. gobiensis effectively have relatively small jugals horns, compared to other species, and they're not too different in size to that of P. mongolienis, although are much more textured by vascular sulci. The postobital/jugal bar bear hornets structures also in P. gobiensis and P. sinensis, although I'm not so sure about the so called 'palpebral horns' of P. sibiricus: I mean, those are simply enlarged palpebrals, I don't understand why these structures would have been covered in a keratinous sheath, unless we consider all ornithischian palpebrals as horn-like structures. They were an attachment for the eyelids, as for the Varanids or other sauropsids. VERY interesting stuff! I had always heard that Pentaceratops had an exceptionally large pair of jugal horns/spikes which led to its name of "five horned face". But for years I have only seen Pentaceratops with a fairly unimpressive set of jugals. Although they were bigger in Protoceratopsids, I think in some Ceratopsids they still had a use. Centrosaurs had decent-sized ones, most Chasmosaurs didn't (except for Chasmosaurus itself) and Triceratops's jugal spikes were PUNY and well on their way to disappearing entirely. The Chasmosaurines eventually seem to had lost any use for jugals since their large frills were usually wide enough to block any attack that could have even come in contact with the jugals! Still, jugals on any species still look downright badass.